Here is an elementary development of the Sinc-Galerkin method with the focal point being ordinary and partial differential equations. 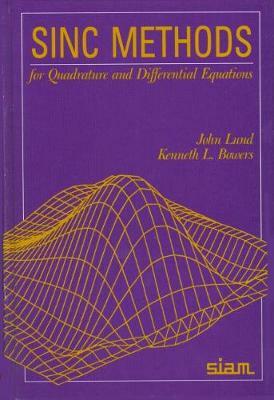 This is the first book to explain this powerful computational method for treating differential equations. These methods are an alternative to finite difference and finite element schemes, and are especially adaptable to problems with singular solutions. The text is written to facilitate easy implementation of the theory into operating numerical code. The authors' use of differential equations as a backdrop for the presentation of the material allows them to present a number of the applications of the sinc method. Many of these applications are useful in numerical processes of interest quite independent of differential equations. Specifically, numerical interpolation and quadrature, while fundamental to the Galerkin development, are useful in their own right. The intimate connection between collocation and Galerkin for the sinc basis is exposed via sinc-interpolation. The quadrature rules define a class of numerical integration methods that complement better known techniques, which in the case of singular integrands, often require modification. The sinc methodology of the text is illustrated on such applications as initial data recovery, heat diffusion, advective-diffusive transport, and Burgers' equation, to illustrate the numerical implementation of the theory discussed. Engineers may find sinc methods a very competitive approach to the more common boundary element or finite element methods. Further, workers in the signal processing community may find this particular approach a refreshingly different view of the use of sinc functions. Sinc approximation is a relatively new numerical technique. This book provides a much needed elementary level explanation. Publisher: Society for Industrial & Applied Mathematics,U.S.